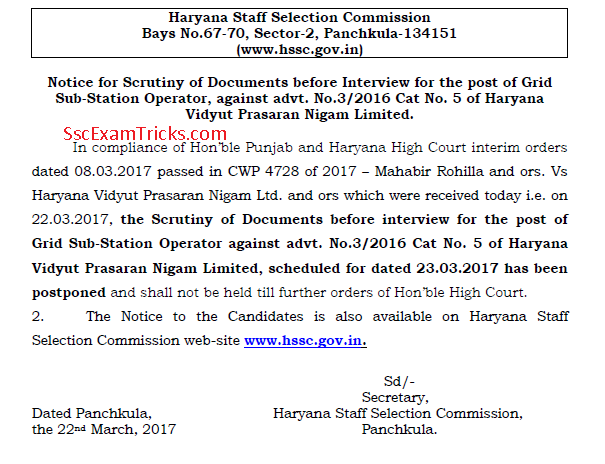 The good news is that Haryana Staff Selection Commission has declared the final result off grid substation operator of Haryana Vidyut Prasaran Nigam Limited honda advertisement 3 / 2016 category number 5. The final result has been published on the basis of written test, document verification and interview inducted by the commission. The final result shown roll number wise and category wise with cutoff marks can be downloaded from the link given here. The final criteria for selection is based on written test of 160 mark, experience of 16 marks and interview of 24 marks. 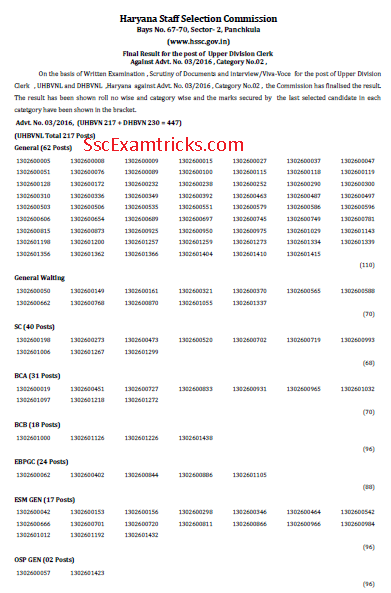 The final merit list is prepared out of 200 marks. Some of the result of petitioners of various cwp number have been kept in sealed cover in compliance of honorable High Court. The final result has been displayed on the official website. Latest News (22.02.2018) - The interview schedule of HSSC Grid Station Operator has been declared now. The good news is that HSSC has uploaded the revised answer keys of the Shift Attendant exam on official website www.hssc.gov.in. 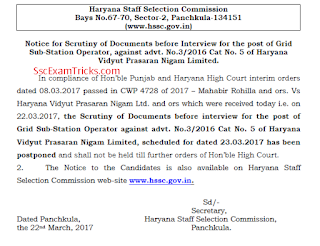 The breaking news is that HSSC has uploaded the schedule of Grid Station Inspector Interview / Viva Voce on official website. The interview has been decided to be held on 12th October 2017 for GSI Advt. 3/2016 Cat. No. 5. The interview call letter can be downloaded with the set of instructions which would be followed during the process of interview. Those candidates who have planned to attend the interview must reach with original document at least half an hour before the reporting time to the venue for completing formalities of checking of candidature. 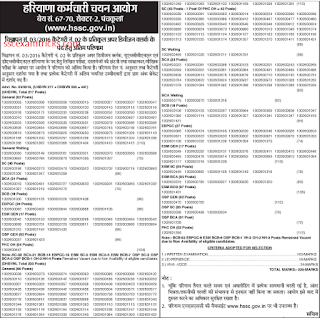 These candidates can download their HSSC Grid Station Inspector interview call letter from the link given here. The interview question may be based on Haryana General Knowledge & History of the state. The candidates are advised to read GK of Haryana before attending the interview. The good news is that Haryana HSSC has declared Shift Attendant result on official website. The roll number wise result has been available. The list of candidates qualified for interview has been published in PDF file. Total 2426 candidates found eligible for interview. The interview has been scheduled from 24th to 26th August 2017 and 28th to 29th August 2017. Earlier HSSC had conducted written test and scrutiny of documents on 29th May 2017 and 05th-11th, 19th May & 06th July 2017 at various centres for the posts of SHIFT ATTENDANT, UHBVNL/HVPNL/DHBVNL , Against Advt. No. 03/2016, Category No. 01. Now, two times candidates to the advertised posts have been called for interview. 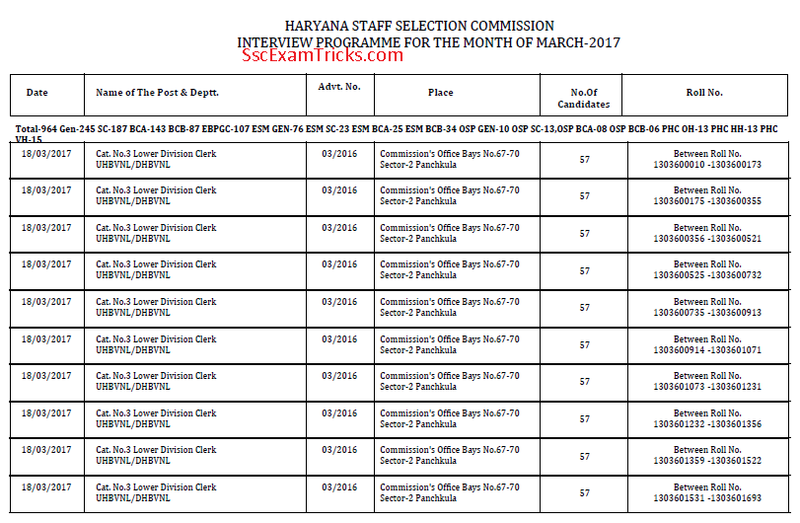 Haryana Staff Selection Commission has published latest notice on 22nd March 2017 regarding the Scrutiny of Document before Interview for category no. 5 under advertisement 3/2016. The schedule verification of original documents which was planned to be organized on 23rd March 2016 has been postponed due to the court orders. The new schedule of scrutiny of documents before the interview will be intimated very shortly on website www.hssc.gov.in. See the latest notice in the image given below. 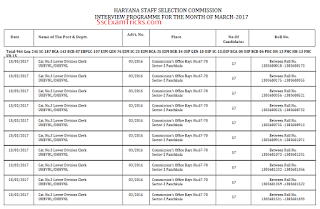 Haryana Staff Selection Board has declared HSSC Upper Division Clerk Result 2017 for Category No. 2 under Advt. 3/2016 on official website www.hssc.gov.in. HSSC UDC Interview which was scheduled to be organized on 18th March 2017 has been successfully conducted by the commission. Total 57 candidates were called for this interview in which most of them have appeared in the viva-vice. Now the commission is preparing their final result which is expected to be available very shortly on the official website www.hssc.gov.in. 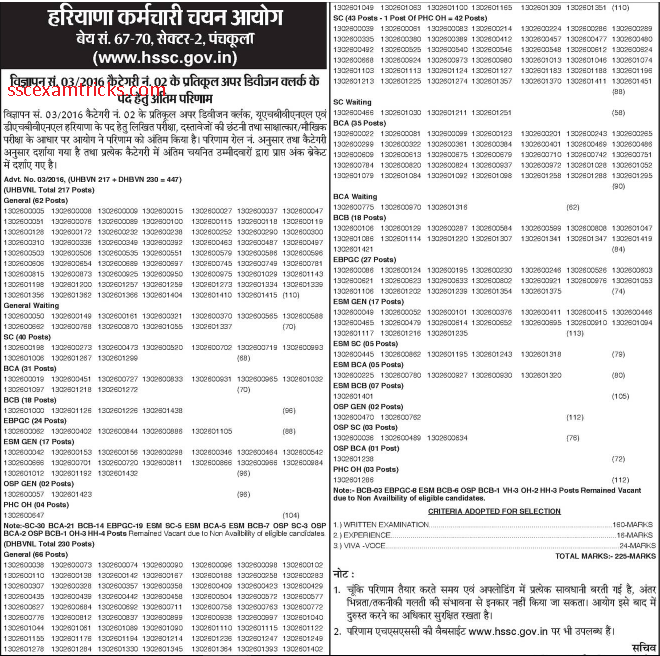 HSSC had released notification/advertisement no. 3/2016 for recruitment of Shift Attendant, Upper Division Clerk, Lower Division Clerk, Assistant Law Officer, Grid Sub-station operator etc. and a huge numbers of application had submitted their online applications from 5th March to 14th April 2016 on website www.hssc.gov.in. The final selection of candidates was prepared from marks in written exam, experience and interview. The written test was organized for 160 marks. The qualified candidates were called for interview which was held for 24 marks. The experience of the candidates was also considered for 16 marks. 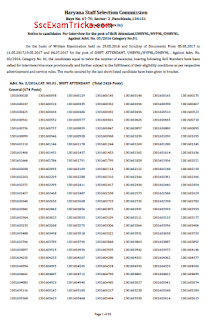 The final result with scorecard/marks obtained by the candidates out of 200 marks are given. Those candidates who had appeared in written test as well as interview on scheduled date, time and venue; they can download their HSSC UHBVNL Result and scorecard from direct link given at the bottom. 1. Go to the result link on official website. 2. 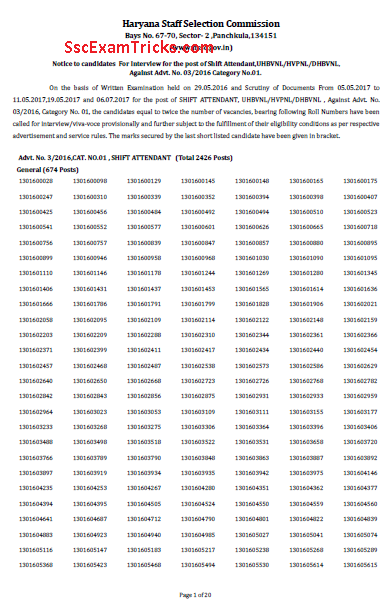 Select ‘Download result of category no 3 advt. 3/2016’ link and download PDF file. 3. Search your roll number in the result and marks list. 4. 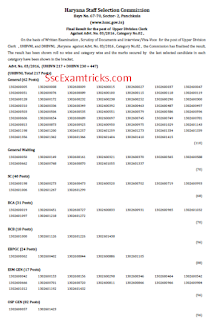 Take a printed copy of the result/marks for the future requirements. 15 Foreman Grade-ll (Thermal)(Electrical Trade). 23 Technician (Thermal) Instrumentation & Control.